30th Street Station is one of the main hubs for transportation in Philadelphia, so most visitors to the city will at least pass through it. However, it is also a viable sight of its own, if only for its architectural renown. It’s a majestic Beaux-Arts building, with a commanding presence over the Schuylkill River. The massive columns are visible down JFK Boulevard, and loom large over the people that walk under them. Inside, the main concourse is incredibly large, featuring a consistent ceiling pattern that stretches from one end of the station to the other, massive, rectangular windows, and large chandeliers evenly spread throughout. The concourse has a satisfying sense of symmetry, which is echoed in the traditional parts of the design. Granted, it is somewhat hampered by the enormous advertisements that frequently adorn the walls, but still. On the north part of the station, SEPTA trains come under glass skylights and steel beams. It has a very classic feel, much like the rest of the station. Despite this, the passageways connecting the main concourse to the Regional Rail station is very modern. It’s also connected to the Cira Center, the 2005 office building designed by Cesar Pelli, who also designed the Petronas Towers in Kuala Lumpur, which were briefly the world’s tallest buildings. Two major artworks can be found in the station. The first is The Angel of the Resurrection, a memorial to the fallen soldiers of World War II. It depicts St. Michael the Archangel lifting a wounded soldier, and can be found in the main concourse. The second is the Spirit of Transportation, which was originally housed in Broad Street Station, and was relocated after its demolition. It is a relief sculpture, attached to the wall outside the restrooms north of the main concourse. It depicts several methods of transportation from the time, including a steam locomotive and a horse-drawn covered wagon. Both of these works are exquisite, with extreme attention to detail throughout. There is no fee to visit the station. Ticket prices for trains vary by which train you’re using, and how far you’re going. There is a massive food court, as any station this big should. Small eateries and fast-food chains can be found throughout, as well as gift shops and newsstands. In the coming years, 30th Street Station will be the center of a new development project for University City. This plan includes parks, a new residential neighborhood, and a 1,200-foot skyscraper. 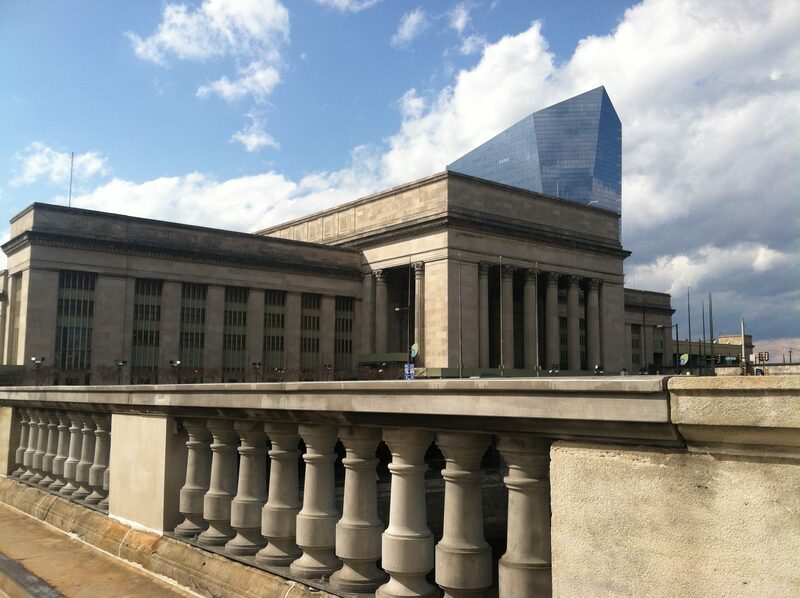 For a guide on 30th Street Station for transit, click here.